Tangles created by nature have been a constant irritant to me. I can neatly wrap a cord or rope, lay it down on the work bench, go into the house and come back into the garage 5 minutes later and when I pick up the cord, it will be a knotted tangled mess. It is inexplicable and the sensation of frustration is acid on my soul. There is a basket in the kitchen that holds odds and ends. Including cell phone chargers. 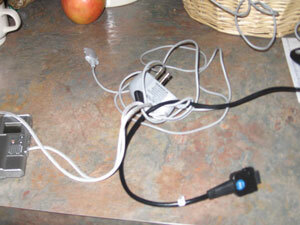 This picture shows two cell phone chargers and one hand held recorder. The recorder lanyard and charger cords are wrap around, in, and through each other in an entanglement that could not be duplicated intentionally. All by merely placing in them into the basket.